Yes, it’s finally hot enough in the D that the last thing you want is to be cooped up indoors, whether it's on a roof with a cocktail or traipsing around the great state of Michigan. But where do you turn to find out where all the outdoor movies are? Certainly not Moviefone; that’s so 1990s. No, because it is 2016, you turn to Thrillist dot com. Welcome. 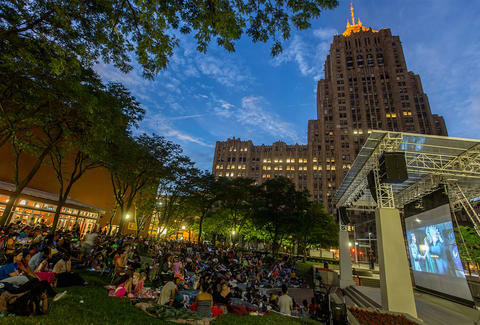 Here, we’ll hook you up with the 411 on all the outdoor movies this summer in metro Detroit. First screening in the United States! Free, family friendly, and concessions from the bar and grill. Free, family friendly, and popcorn, beer, wine, and other beverages for purchase from local food vendors. Free, family friendly, and BYO picnic (and chairs).